Treatment planning in today's environment can be very confusing for both the patient and the dentist. Patients can present with a myriad of problems, some obvious and others not so much. 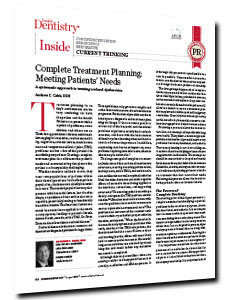 Creating a complete treatment plan that addresses the patient's needs and communicating that plan to the patient can be especially challenging. In this article, originally published in Inside Dentistry, Dr. Andrew Cobb discusses a systematic approach to treating occlusal dysfunction and meeting patients' needs. To download this free article, complete the form with your contact information.